Xovimat playing cards Xovimat playing cards. Version of 12 November 2007. Xovimat playing cards are offered as an alternative to the traditional rank-and-suit cards used in Western culture for some 600 years. Some other endeavors in this direction have been Mille Bornes, Set, and 1000 Blank White Cards. Wikipedia lists many more dedicated-pack card games. However, many of them still have a rank-and-suit structure, such as Uno and Five Crowns. Others, for instance Flinch and Racko, have ranks but omit suits. Below are some typical Xovimat playing cards, pictured on a green background. Each caption has a link to a pdf file offering higher resolution and a better font. In the center of the card are several boxes, each of which is a rectangle (usually square) containing zero or more dots, also known as pips. A box, which is large enough to be read across a card table, resembles one face of a cubical die or half of a domino. The valence is the quantity of boxes. In two corners are indices, numerals corresponding to the pips in the boxes. These allow a person holding several cards in his hand to partially overlap them and still see all the information. These numerals are conventionally written in order from largest to smallest, and the quantity of numerals is equal to the valence. In one corner is a serial number (in a smaller font then the indices) which is not consulted in play, but rather used beforehand to verify that the pack is complete. Where the front of the card is not printed with boxes or numerals, it is white. The back of each card can be printed with any desired design, but all cards in a pack should have the same design. If a pack allows numbers to be repeated on a card, all cards are printed in red ink (example A). If on the other hand repetition is prohibited, blue ink is used (example B). The color difference alerts players if cards from the two kinds of packs are inadvertently mixed. Hence the red 5-5-4-3-3 card of example A could not appear among the blue cards in example B; this is why the 6-5-4-3-2 card was substituted. The calculation of serial numbers is influenced by whether repetition is permitted, and this explains why the 9-6 of example A has a serial different from the 9-6 of example B. If there are to be more than nine pips in a box, a larger box is convenient, as in the illustrations below. If a pack's valence is one (as in example E), there is no way to tell whether repetition of indices is permitted or not; hence the cards are printed in purple, a color often regarded as halfway between red and blue. The serial will always be the same as the index. Doubtful is whether any interesting games can be devised with such cards, so the pack of valence one receives little further attention. Meanwhile, a pack whose valence is zero can have only one card. Xovimat playing cards have no special requirements with regard to height, width, thickness, weight, et cetera. The illustrations (design details) assume rectangular cards with an aspect (height-to-width ratio) of 1.4; this is the same as found on American poker size cards (3.5 × 2.5 inches), which are practically the same as ISO size B8 (88 × 62 millimeters). However, the cards could easily have any other desired size or aspect. More broadly, the cards need not be rectangular at all: for instance, circular playing cards have been manufactured at various times in history. Xovimat packs can be manufactured with different numbers of cards. Within a pack, no two cards are the same, but all have the same valence. Every standard pack has a designator, which is a listing of the indices of that card which has the highest serial number. The quantity of numbers in the designator corresponds to the valence of each card in the pack. For a red pack, all the numbers in the designator are the same; but for a blue pack it contains consecutive integers. A designator is written in bold type, while the list of indices for one card is written in plain type. For instance, 9-8-7-6 indicates a pack of blue cards, and 7-5-4-2 is one card within that pack. The highest number appearing in any index is 8. Valence = 2, floor = 8, ceiling = 8. There is a card for each combination of the numbers 0 through 8; repetition is allowed. This pack (table or image) has 55 red cards. The highest number appearing in any index is 9. Valence = 2, floor = 8, ceiling = 9. There is a card for each combination of the numbers 0 through 9; repetition is prohibited. This pack (table or image) has 55 blue cards. The highest number appearing in any index is 4. Valence = 3, floor = 4, ceiling = 4. There is a card for each combination of the numbers 0 through 4; repetition is allowed. This pack (table or image) has 35 red cards. The highest number appearing in any index is 6. Valence = 3, floor = 4, ceiling = 6. 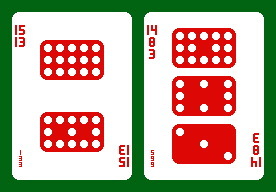 There is a card for each combination of the numbers 0 through 6; repetition is prohibited. This pack (table or image) has 35 blue cards. Valence = 4, floor = 4, ceiling = 4. This pack (table or image) has 70 red cards. The highest number appearing in any index is 7. Valence = 4, floor = 4, ceiling = 7. There is a card for each combination of the numbers 0 through 7; repetition is prohibited. This pack (table or image) has 70 blue cards. The highest number appearing in any index is 3. Valence = 5, floor = 3, ceiling = 3. There is a card for each combination of the numbers 0 through 3; repetition is allowed. This pack (table or image) has 56 red cards. Valence = 5, floor = 3, ceiling = 7. This pack (table or image) has 56 blue cards. These are by no means the only feasible packs. The valence of X equals the valence of Y, and the floor of X equals the floor of Y. For example, 5-5-5 and 7-6-5 both have a valence of 3 and a floor of 5, and each has 56 cards. The valence of X equals the floor of Y, and the floor of X equals the valence of Y. For instance, the packs designated by 2-2-2-2-2 (five twos) and 5-5 (two fives) will each have 21 cards. In a less obvious example, the packs 6-5-4 and 6-5-4-3 each contain 35 cards (explanation). The packs 4-4-4-4 and 7-6-5-4, satisfying both criteria, are doubly congruent. Although the packs 14-14 and 7-7-7 have an equal number of cards (120), they are not congruent because they do not meet either criterion. Pascal's triangle gives some insight on this. See also a listing of serial numbers. Below are listed are some stardard mechanisms found in popular card games, and how they may be adapted for Xovimat cards. Some options give a result which is hard to obtain with rank-and-suit packs; if this were not so, there would be no reason for introducing Xovimats. Matching a previous card. Games of the Crazy Eights family feature a stack of face-up cards in the middle of the table. In his turn, a player who holds a card matching (in rank or suit) the top card of the stack adds his card to the stack -- but it is always legal to play an eight. Lacking a matching card, the player must draw a card from the undealt portion of the pack. Whoever gets rid of all of his cards first wins. Suggested for Xovimat play is to use the 9-9 pack, defining two cards as a match if they have at least one index in common. For instance, 7-4 matches eighteen cards, among them 9-7, 7-7, 7-2, 5-4, 4-4, 4-1. Meanwhile, a card with a double index has only nine matches, as 6-6 which is matched by 8-6 and 6-1. (Were the 10-9 pack used instead, there would be no double indices.) Note that matching is not transitive: 6-0 matches 8-0 which matches 8-3, yet 6-0 does not match 8-3. To get a rough idea of how likely a player will have a card that matches the top of the pile, one can observe that if two cards are drawn at random from the entire 9-9 pack, the probability that they will match is 10/33, which is almost one-third. Meanwhile, two cards from the 10-9 pack will match with a probability of 11/33, which is exactly one-third. For games of this genre, one-third is a reasonable figure -- it applies, approximately, to traditional Crazy Eights as described above. To increase the probability of matches, one can decrease the ceiling. One can also increase the probability of matches by increasing the valence, but even with a valence of three there can be so many matches that a stricter definition of matching will be needed to prevent play from becoming too simple. To illustrate this, consider the 35-card 6-5-4 pack; each card has 30 matches, and only 4 non-matches. Of the same size is the 4-4-4 pack, where the quantity of matches is variable but still large. A card with three different indices, such as 4-3-2, has 30 matches; with two different indices, such as 3-3-2, there are 24 matches; and with all indices equal, such as 1-1-1, 14 matches are available. A variation which gives considerable scope for tactics allows a player, when laying a card on the pile, to specify which one of the three indices the next player has to match. When playing 6-3-2, for instance, a player can announce "match the two". Again, there are 35 matches out of 119 cards when the 9-8-7 pack is used. Vertical: several cards of the same suit, in consecutive ranks. How these can be addressed with Xovimat cards is addressed as follows, with examples based on the 7-6-5 pack. the bottom index, as 6-2-1, 5-4-1, 4-2-1.
the middle and bottom, as 7-2-1, 5-2-1, 3-2-1. For cards to agree in all three positions requires that multiple packs be used. Vertical melds. A suggested criterion calls for the top indices to be consecutive, middle indices to be consecutive, and bottom indices to be consecutive. An example is 6-5-2, 5-4-1, 4-3-0, where the sequence of top indices is 6, 5, 4; of middle 5, 4, 3; and of bottom 2, 1, 0. Note that the indices within a card need not be consecutive. If the 7-6-5 pack is used, the longest possible sequence is 7-6-5, 6-5-4, 5-4-3, 4-3-2, 3-2-1, 2-1-0. Meanwhile, 6-4-0 and 7-2-1 are examples of cards that could not appear in any sequence of length greater than two; and a card like 7-2-0 appears only in the minimal sequence of length one. This variation in length contrasts with that of sequences made from cards in a rank-and-suit pack, which in rummy games all have the same maximum length regardless of suit. Another approach is found among the members of the Bezique family: the length of a sequence meld is ordinarily fixed at five cards (ace-ten-king-queen-jack), and does not include all the ranks of cards appearing in the pack (nines for instance are unmeldable). matching at the bottom, as 6-3-0, 5-2-0, 4-1-0.
sequenced at the bottom, as 7-5-3, 7-5-2, 7-5-1. There is no necessity that a game recognize all of these meld categories. Excessive complication is a risk, as is trivialization because too many melds are permitted.